"We do not have a scarcity problem, the problem is we have not learnt how to handle money properly." Whatever your level is today financially, the truth is you have enough to cater for your needs; if only you can change your present spending habits that leaves you with ‘not enough’. In other words if you will be free from anxiety in this present economy you need to a change your attitude in the handling of money and the present financial stress will be over. Personal Financial Planning addresses all the financial planning issues necessary for individuals and families in order to enjoy peace in their finances. It is the secret to experiencing financial rest and it is also the key to achieving your financial goals. Financial goals represents what you need or desire to achieve financially in the near future or at a future date; examples include paying your annual rent, children’s school fees or even purchasing a car to mention a few. Everyone needs to develop financial plans to meet their goals and in order to have control over their finances as knowing what you hope to accomplish financially and how you intend to do it clearly gives you an edge over someone who merely reacts to financial events as they unfold. For instance, if you have to pay the rent of where you live in the next one year, making plans by saving a certain amount monthly for twelve months will guarantee your ability to pay without embarrassment from the landlord. This definitely will take discipline and commitment which are virtues the financial planning process helps you to embrace if you will achieve your financial goals. The Wikipedia defines Personal finance as the financial management which an individual or a family unit performs to budget, save, and spend monetary resources over time, taking into account various financial risks and future life events.When planning personal finances, the individual would need to consider their present and future needs, the various sources of income and their plans for the future. In the present economic state of our country Nigeria, planning your finances has become a necessity if you will be free from anxiety and meet your financial obligations with ease. Also, sound financial planning will help you to acquire, use and control your financial resources more efficiently. Essentially, planning your finances allows you to gain more enjoyment from your income which in turn will improve and help you maintain your standard of living. In other words you can accommodate the necessities, comforts and luxuries you desire when you cultivate good saving habits. Improving your standard of living brings you face to face with the reality of your spending or consumption habits. Your current level of consumption is based on what you consume on necessities i.e. food, clothing and shelter; and your propensity to consume. 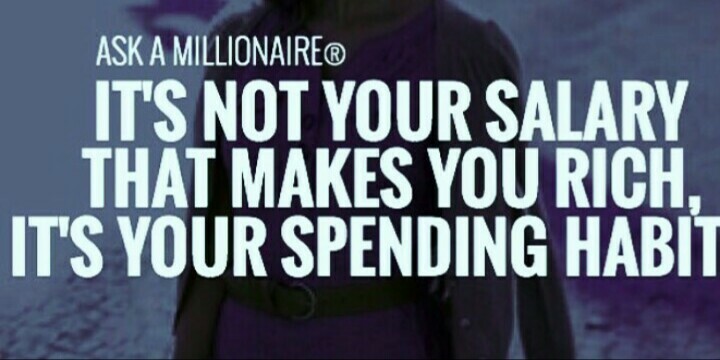 In a lay man’s language your propensity to consume is how much you are willing to consume rather than save. In a well thought out plan a portion of your current income should be set aside for future consumption. For example money can be set aside for future holiday, or a child’s education or even for furthering your education. The money put aside can be put in savings or investment products to generate income during the time it is held. When this is a way of life it affords you the opportunity of improving your standard of living and creating wealth. Another benefit of planning your finances is that it gives you the opportunity to spend money wisely all the time and not just once in a while. To spend money wisely requires you determining what your consumption pattern is like. A critical examination of this helps you decide on what you should do with the money you make. This certainly enables you to enjoy more from your income. Given a certain level of income you can spend a portion and also save a portion of it for future consumption. This is done by determining what your current and future needs are. The goal is to plan how to spend your money to get the most satisfaction from your earnings. Planning your finances also helps you direct your financial resources to the most productive areas; it helps you through tough times like the example of Joseph in the bible. Joseph during the time of plenty set apart food to meet a future anticipated famine. Very importantly, planning your finances also keeps you out of debt as planning gives you control over your income. HOW DO YOU PLAN EFFECTIVELY? Everything God gives you today is for both today and the future. As stated earlier Joseph planned for years of famine from years of plenty. The same also applies today, there must be a plan for your life in the area of money. To plan effectively you need to be well informed about the planning process; be futuristic in your approach i.e. do not think only about the present. In addition you need to develop a proper money management lifestyle; this will require you to review your consumption habits. 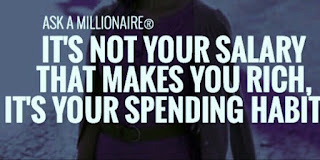 Be disciplined in your spending i.e. know where your cash is going and start thinking of how you need to be more responsible with your money. Assessment: The first step in the process is to sit down and assess your present financial situation. A person's financial situation is assessed by compiling simplified versions of financial statements including balance sheets and income statements. A personal balance sheet lists the values of personal assets (e.g., car, house, stocks, bank account), along with personal liabilities (e.g., loans, debts, bank loan). A personal income statement lists personal income and expenses. Goal setting: Having multiple goals is common, including a mix of short- and long-term goals. For example, a long-term goal would be to "retire at age 65 with a personal net worth of N1, 000, 000," while a short-term goal would be to "save up for a new computer in the next month." Setting financial goals helps to direct financial planning. Goal setting is done with an objective to meet specific financial requirements. Execution: This is carrying out what has been planned. Execution of a financial plan often requires discipline and perseverance. The success of handling money is a function of our values and principles. When we order our lives based on biblical values and principles i.e. values and principles based on God’s word, we become candidates for God’s financial blessings. These values and principles is expressed in our attitudes. Attitudes can therefore be referred to as inclinations or dispositions with regard to something or a person. It is the way our mind works; as it is often said “as a man thinks so is he”. Our way of thinking defines who we are. Therefore, there are attitudes you need to cultivate if you will be successful in personal financial planning and the handling of money which consequently will enable you enjoy financial prosperity. Contentment certainly will go a long way in making execution of your financial plans a success as a contented person will have control over impulsive buying and spend within their planned limits. “He that loveth pleasure shall be a poor man: he that loveth wine and oil shall not be rich...There is treasure to be desired and oil in the dwelling of the wise; but a foolish man spendeth it up. A disciplined person will always stick to the plan, and that is what makes financial planning a success. Borrowing is not a sin, it is just a weight that can rob you of your peace and liberty. Rather than borrow discipline yourself to spend within the available resources you have. Think about it, ‘consumers will always be in want’. A study conducted in America revealed the real millionaires ‘Live well below their means’. They do not spend for immediate gratification, usually they defer pleasure to some other time. These people operate on a budget, they have financial goals and plan their financial future.